Baldo’s is about distinction when it comes to our ingredients. Each offering, whether hot or cold, is composed of a few thoughtful ingredients. We make everything from scratch in small batches on a daily basis. We locally source our ingredients whenever possible with partners including Bonton Farms (Dallas), the Miller Farm (McGregor), Kai Organic Farms (Waco), and Little City Coffee (Austin). Baldo’s is committed to improving the community around us through partnerships and collaborations. We hope you enjoy eating our quality ingredients as much as we enjoy making them. Anything but vanilla. It’s the core of our food philosophy. Vanilla is familiar. It’s classic. It’s comfortable. But vanilla doesn’t provide us with new experiences. It doesn’t expand our horizons, or prompt us to share with others. We live in a vanilla era – where comfort is king and change can be challenging. Baldo’s is here to offer an alternative way. We invite any and all flavors to the dipping cabinet. We incorporate art, community, and culture into our food. So go ahead – why not try that crazy flight of mini cones? You may well leave there with a whole new outlook. Can't decide on one flavor? That's okay... we have flights of mini waffle cones. Get a sample flight of three or six and enjoy with friends and family! 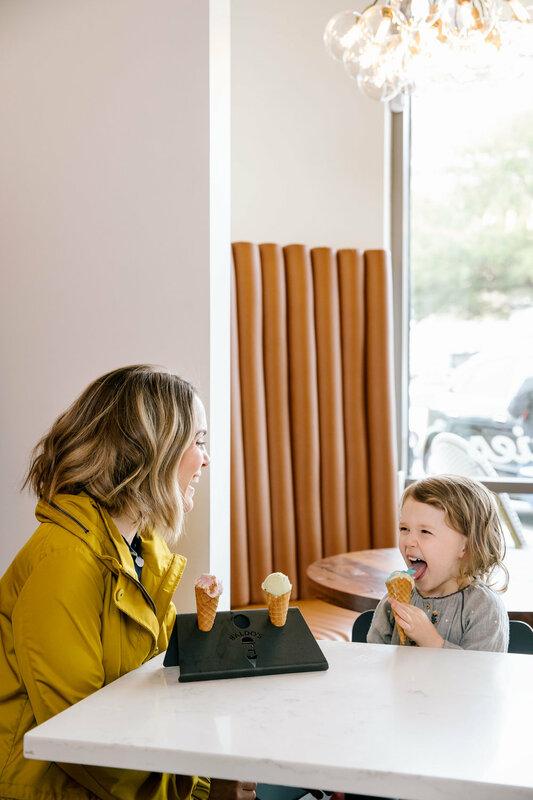 Baldo’s began in the summer of 2017 with three SMU graduates, fixated on bringing quality handmade ice cream to Dallas. With the vision in place, we needed one more thing: culinary expertise. So we teamed up with local artist and chef, Aldo Sandoval, and bought an ice cream machine. Since then, we’ve been perfecting the recipes and popping up around town with our mobile push cart. Now it’s time for us to open our first Scoop Shop Café. With a coffee shop atmosphere and a rotating selection of ice cream, cookie dough, pastries and coffee, Baldo’s is a gathering place for any time of day. So come by and enjoy a scoop or a sampler flight. Our unique flavors compel conversations, and leave our guests wondering what’s next.